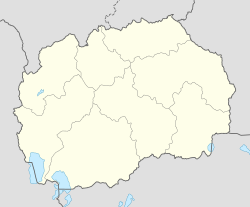 Veles (Macedonian: Велес [ˈvɛlɛs] ( listen)) is a city in the central part of the Republic of North Macedonia on the Vardar river. The city of Veles is the seat of Veles Municipality. Vilazora was initially the Paeonian city Bylazora from the period of early Classical Antiquity. The city's name was Βελισσός Velissos in Ancient Greek. Under Turkish rule it became a township (kaza) called Köprülü in the Üsküp sanjak (one of the administrative divisions of the Ottoman Empire). From 1877 to 1912 the sandjak was part of the Kosovo vilayet. From 1929 to 1941, Veles was part of the Vardar Banovina of the Kingdom of Yugoslavia. After World War II, the city was known as Titov Veles after Yugoslavian president Josip Broz Tito, but the 'Titov' was removed in 1996. Cars registered in Veles were identified by the code TV (Titov Veles), which was changed as late as 2000 to VE. Veles in the 19th century. The area of present-day Veles has been inhabited for over a millennium. In antiquity, it was a Paionian city called Bylazora, and contained a substantial population of Thracians and possibly Illyrians. It was then part of the Byzantine Empire, and at times the First and Second Bulgarian Empire. It became part of the Kingdom of Serbia at the end of the 13th century, while during the Serbian Empire (1345–71) it was an estate of Jovan Oliver and subsequently the Mrnjavčević family until Ottoman annexation after the Battle of Rovine (1395). Before the Balkan Wars, it was a township (kaza) with the name Köprülü, part of the Sanjak of Üsküp. The Annuario Pontificio identifies Veles instead with the Diocese of Bela, a suffragan of the Metropolitan Latin Archdiocese of Achrida (Ohrid) in Bulgaria, and lists it, as no longer a residential diocese, among the Latin titular bishoprics. It is probably in Bosnia and Hercegovina  (modern Velika?). Through Macedonia Veles is known as industrial center and recently, as a leader in the implementing of IT in the local administration in Macedonia. Veles is a place of poetry, culture, history and tradition, as well as a city with plentiful and precious cultural heritage and centuries old churches. Veles is a municipality of 55,000 residents. The geographic location of the city of Veles makes it suitable for hiking and camping, especially at the west side of the city. One such location is the tranquil village Bogomila. Nearby there is the man made lake Mladost, which is known as the city's recreational centre. Veles made international news in 2016 when it was revealed that a group of teenagers in the city were controlling over 100 websites producing fake news articles in support of U.S. presidential candidate Donald Trump, which were heavily publicised on the social media site Facebook. Two TV stations operate in Veles -Channel 21 & Zdravkin- and many radio stations. ^ Nicholas Kristof (2016-11-12). "Lies in the Guise of News in the Trump Era". Retrieved 2016-11-21. ^ Dan Tynan (2016-08-24). "How Facebook powers money machines for obscure political 'news' sites". The Guardian. Retrieved 2016-11-21. ^ "Međunarodna suradnja Grada Pule". Grad Pula (in Croatian and Italian). Archived from the original on 2012-05-05. Retrieved 2013-07-28.